Remembering Aldo Leopold, Visionary Conservationist And Writer Leopold's A Sand County Almanac was published in 1949. Decades after his death, his work is at the cutting edge of his field — and his words inspire a new generation of environmentalists. 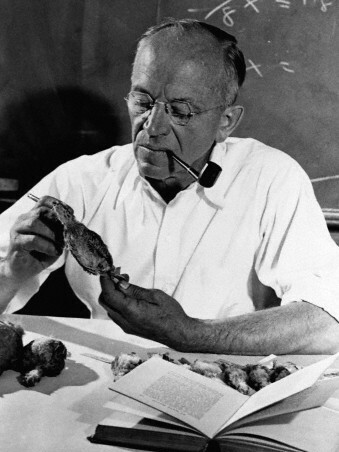 Aldo Leopold examines a dead bird. The original book was published in 1949, a year after Leopold's death. Leopold pioneered the science of ecology using only binoculars and a notebook to observe wildlife and seasonal patterns in his southwestern Wisconsin home. Even now, 64 years later, Leopold's work is on the cutting edge of his field, and his groundbreaking writings on conservation and ecology become more relevant with each passing year. Three generations of conservation scientists have been inspired by Leopold's A Sand County Almanac. Stan Temple read the book as a teenager, and was captivated. Now, he is professor emeritus in conservation at the University of Wisconsin, the same position Leopold held during his tenure at the university in the 1930s. "It's like he was so far ahead of his contemporaries that the things he was writing about before his death really didn't find an audience until 25 years later," Temple says. Temple would know. He recently used Leopold's journals to gain insight on climate change, though Leopold himself never lived to hear about global warming. Every single day, Leopold would sit outside on his hand-built bench on his land and write about what he saw, leaving behind a meticulous daily record of the changing seasons and natural patterns of the 1930s and '40s. By comparing Leopold's meticulous observations of springtime in his day to springtime in 2012, Temple could clearly see the speed of climate change, and that our winters are getting increasingly warm. But even when Leopold was writing, the wild lands of America were in a sorry state. "It was really a time of incredible change in the entire landscape," says biographer Curt Meine. "The great forests of the upper Great Lakes were being leveled, the wetlands of the Mississippi River Basin were being drained, waterfowl and wildlife were being depleted, the prairies of the Midwest were being converted over to agriculture." In Leopold's youth, Teddy Roosevelt was president, and environmental preservation was a national discussion for the first time. Leopold's father taught him how to hunt and respect the land. Leopold would later graduate from the Yale School of Forestry, and join the Forest Service as a ranger in the mountains of Arizona. It was on that job that Leopold had an experience that shaped his thinking for the rest of his life. While hunting one day, he and his friends came upon a pack of wolves and opened fire on the animals. Leopold killed an old wolf, and wrote about it 35 years later in one of his most famous essays, "Thinking Like a Mountain." He wrote: "We reached the old wolf in time to watch a fierce green fire dying in her eyes. I realized then and have known ever since that there was something new to me in those eyes, something known only to her and to the mountain." Thinking about this event, Leopold realized that preserving land wasn't enough — we had to actively protect it. So he and his family bought a piece of ravaged land near Baraboo, Wis., and set about rejuvenating it. There were hardly any living plants on the property, and the dry, dusty soil was vulnerable to wind erosion. So Leopold started by planting pine trees. Every spring, he would drag his family up to the tiny shack on the property, and eventually, they had 50,000 planted pine trees bringing life back to the desolated area. There, inside the bare-bones shack, Leopold wrote his second-most-famous essay, "Land Ethic." The essay argues for the responsible, ethical treatment of nature, which became the core of modern conservationism. "In short, a land ethic changes the role of Homo Sapiens from conqueror of the land community, to plain member and citizen of it," he wrote. "It implies respect for his fellow members, and also respect for the community as such." 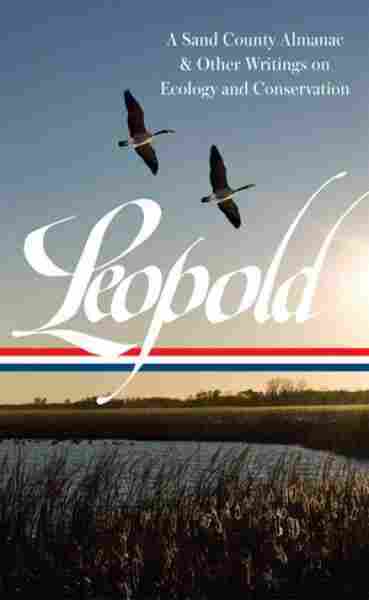 Leopold's "Land Ethic" is still relevant today, especially given the new challenges of global climate change, and the public debate surrounding the issue. But Leopold would say that these challenges are what his "Land Ethic" is for. "It's inconceivable to me" he wrote, "that an ethical relationship to the land can exist without love, respect and admiration, and a high regard for its value."